This is a perfect make-ahead meal (or meals) when you want to come home to something good after being out in the field, and don’t have the time or energy to cook. Brown venison with the onion. Mix in the remaining ingredients and cook over low heat for 30 minutes or in the crock pot on low for the afternoon. 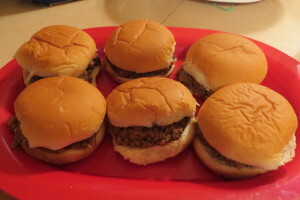 Serve on buns, or cool and freeze in a container, or serving portion baggies for later use. Works great to thaw and quickly heat when ready for dinner, or place frozen in a crockpot on low for the day while you are away. Sound yummy? If you try it out let me know what you think! Check out more great recipes under my Killer Cookin’ blog category, and please feel free to share with others who may find interest and value in PR Brady AdVentures!